The all-new QUICKLINK system boasts an intelligent, streamlined design that speeds up the roll-out of new wireless point-to-point links. The new solution provides a step-up in the deployment of fixed point-to-point wireless links, allowing the system to quickly align, monitor, and optimize highly critical broadband connections in minutes; reducing installation time and maximizing the throughput of the link. Rapid antenna location and synchronization. Dual axis actuators align for link acquisition. Full customization setup allows for near universal list of antenna/radio configurations. All-integrated, hand-held control unit solution. Provisioning available with laptop or smartphone. 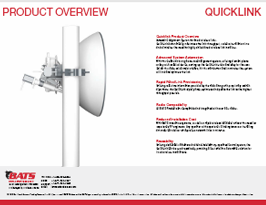 wireless lobes to locate the center point, providing quick network links at the highest throughput possible. BATS innovative Automated Antenna Alignment system delivers efficient wireless back-haul links without need for an experienced RF engineer. Any operator with experience climbing towers can deliver an ultra-precise network link in under 20 minutes.